Even if you’re gluten free and dairy free, you can still join in the celebrations as more gluten free and dairy free sausages are becoming available in supermarkets. When Ray and I dine out, we generally avoid sausages as they often have milk, gluten or wheat in them. If you’re queuing at a busy hotel buffet breakfast, no-one has the time to answer your crucial questions “Do the sausages contain milk/gluten/wheat?” If there’s a lull and you rush up to ask them, chances are they don’t know and there’s no-one in the kitchen who knows either. Occasionally we’ve struck lucky and someone does know, but we usually can’t eat them. Very very occasionally the catering staff have the packaging to hand with an ingredients list so we can check it ourselves. In the supermarket it’s totally different thank goodness. In Waitrose, for example, www.waitrose.com there’s Waitrose Lovelife Gluten Free British sausages, which happen to be dairy free when you read the label. Strange they don’t label the product “gluten free and dairy free”. This is one of our favourites, but unfortunately it can be difficult to track down. 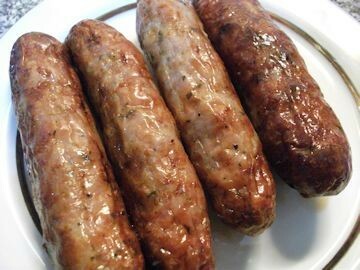 Another favourite are the pork sausages from The Black Farmer (pictured) www.theblackfarmer.com which are gluten free, wheat free and dairy free. The company also produces free from meatballs and burgers. We’ve found these sausages in Sainsbury’s www.sainsburys.co.uk although you can order direct from the web site. We recently discovered Heck www.heckfood.co.uk Smoky Chorizo Style sausages, gluten and dairy free which were delicious. Heck produces a whole range of sausages but you need to check the ingredients carefully as they’re not all gluten and dairy free. Dee’s Wholefoods www.deeswholefoods.com offers a range of vegan sausages, which does mean dairy free, but not necessarily gluten free so you always need to check. I sampled some at Vegfest in Brighton, which were delicious. Varieties include Leek and Onion, Traditional Vegan and Roast Garlic and Mushroom, which don’t contain gluten. You can shop online or see the web site for your nearest stockist. We ordered a sponge cake online, which is both dairy free and gluten free from www.sponge.co.uk We received it the next day. The “Elizabeth” sponge cake, available in 7in and 10in, is a delectable mouth watering cake with sultanas and apricot jam. Ray and I loved it. It was so moist and flavoursome unlike other “free from” cakes we’ve tasted, which can be too dry. What’s more, the cake arrives beautifully packaged complete with serviettes. It’s the ultimate gift. 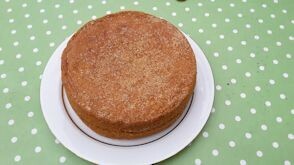 The company also produces a range of gluten free cakes with a good sized filling of butter icing!